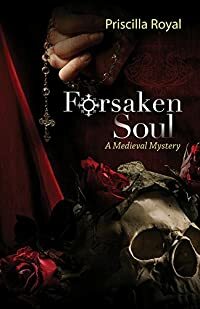 Forsaken Soul by Priscilla Royal, a Mysterious Review. In the summer of 1273, Prioress Eleanor is training a new Prioress, Sister Ruth, and a new anchoress, Sister Juliana. An anchoress lives in a single, small room and listens to visitors who need counsel. Her only duty is to listen and give advice during daylight hours. Sister Juliana, however, insists on only night-time visitors — for reasons known only to her. This causes dissention inside the Priory, especially for Sister Ruth. The Priory serves both the spiritual and worldly needs of the village. Between her duties at the Priory, her work with the monks and the police, Prioress Eleanor is kept busy trying to keep peace and bring the unbelievers to God. Special thanks to guest reviewer Betty of The Betz Review for contributing her review of Forsaken Soul. Acknowledgment: Poisoned Pen Press provided an ARC of Forsaken Soul for this review.